Most modern upholsterers create their cushions and backs and arms using limited materials: various foams, and Dacron® or cotton batting. Occasionally they will use feathers and downs. toe (straw), excelsior (wood shavings), Spanish moss, kelp, kapok, cotton, wool (and various lints), feathers and down. I tricked you a bit, because this is actually on fibers, and I am spotlighting palm fiber, in the form of algerian and coir. 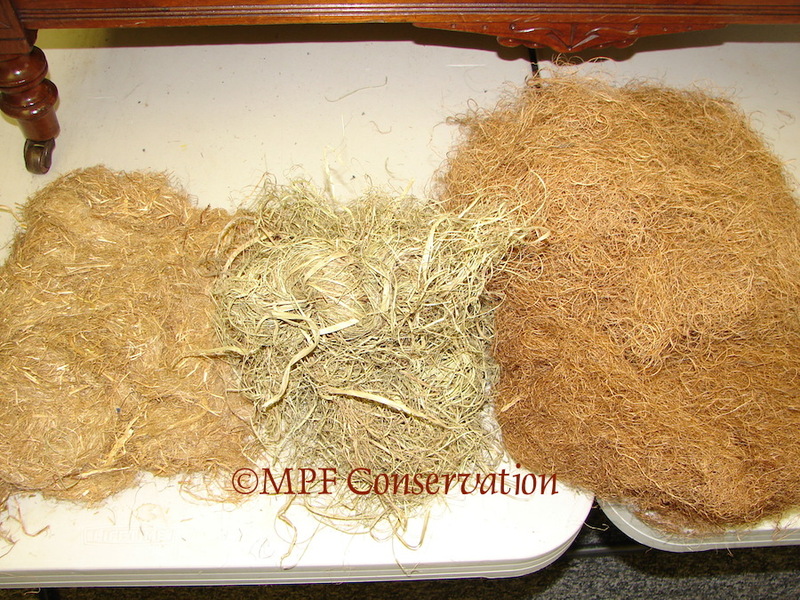 Coir is soft and red, shown top right, while algerian is long and harder, and a soft green. It comes, traditionally, in long ropes, which the upholsterer has to unwind to use. In our business we rarely use modern upholstery stuffings, other than down or organic cotton, but have used all of the traditional stuffings at one time or another, because the original stuffings in a piece we were conserving was made from them! They are hard to locate in the USA; most of our stuffings come from other countries. As a paper maker, I also have used many of these plant materials, pounding them into pulp, or leaving bits for interest. I imagine if we were to conserve a traditional Japanese upholstered cushion, we might gampa or kozo inside, fibers which create traditional Japanese papers! Below, Mitchell has built up the form on the Eastlake Sofa-bed using coir (red) and algerian (green) as the first step. You can see his stitches in waxed twine through the stuffings. not for use on blogs without permission. This entry was posted in conservation techniques, preservation, restoration techniques, upholstery and tagged algerian, coir, down, feathers, flax, hemp, linen, organic cotton, spanish moss, stuffings, traditional upholstery. Bookmark the permalink. I never thought about what types of products the cushions could be made of- very interesting perspective!